There are differences between a single latch and a deadbolt latch. A single latch is rounded and spring loaded. When a door knob is turned to open the latch allows free access inside due to the round end. When the door is being closed the spring is pulled back allowing the single latch to retract slightly and close. A deadbolt is solid and simply retracts instead of being spring loaded. This latch retracts in or out by using a key, motor use, or with a turn knob. Single Cylinder Deadbolt lock: This type of a deadbolt lock is quite simple. You use a key to unlock the door and a knob on the back to lock it. Double Cylinder Deadbolt lock: If you do not prefer to use a twist knob to lock the door a double cylinder lock may be for you. This type uses a key to lock and unlock the device. *Important Note: due to the requirement of using a key on both sides of the lock, this lock will not be approved by most fire departments in case of emergencies. This could be perfect for windows. Keyless Deadbolt: This type of deadbolt could be very convenient. 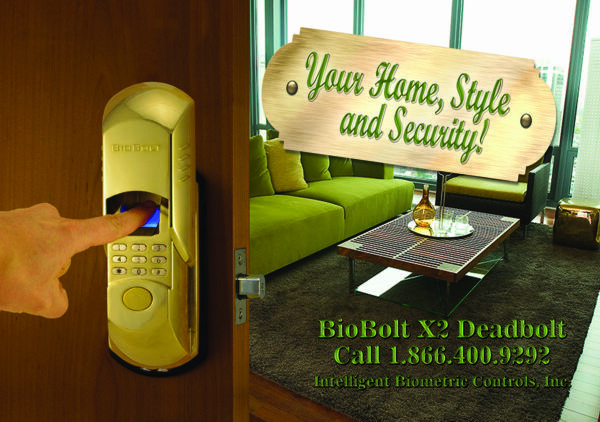 You can simply open the door with your fingerprint scan and lock the deadbolt with a turn knob or by pushing a button. Many of these locks also offer the ability to use a pin code or even a remote control to unlock the device. John is a writer and technical guru for Intelligent Biometric Controls, Inc. that is constantly tinkering between cooking amazing lunches and explaining access control to anyone that will listen. How is Anti-Passback used with Access Control?